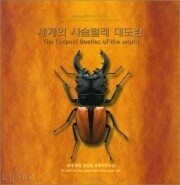 Produktinformationen "The Lucanid (Stag) Beetles of the World"
This photobook contains about 500 photos of stag beetles from 197 species 31 generic from Korea and around the world. The Lucanus, which has mandibles that look like the large horns of deer are more than enough to charm not only insect enthusiasts, but the common viewer as well. 국내에서 첫출간되는 세계곤충표본도감. 고해상도의 사진과 입체감 있는 그래픽기법의 원색사진 곤충표본도감이다. 저자가 20여 년간 세계를 돌아다니며, 채집하고 수집한 곤충표본 중 ‘사슴벌레’ 한 종류만을 촬영하여, 31속 197종을 포함한 약 500여 장의 사진을 실었다. 곤충에 대한 모든 정보를 한눈에 알아볼 수 있도록 체계적으로 정리했다. Weiterführende Links zu "The Lucanid (Stag) Beetles of the World"
Unser Kommentar zu "The Lucanid (Stag) Beetles of the World"
Kundenbewertungen für "The Lucanid (Stag) Beetles of the World"